Colombia and Korea marked on Friday their bilateral free trade agreement coming into force, signaling an enhanced level of economic cooperation in the future. The accord, which had been pending congressional ratification in Bogota, is the Latin American country’s first such agreement with an Asian economy. It will serve as a gateway to Asia-Pacific for Colombian firms and a bridge to Latin America for Korean enterprises, according to the Korea International Trade Association. 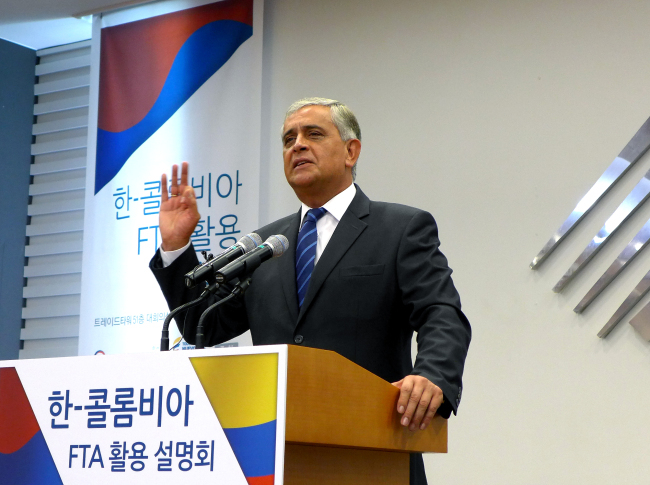 “Colombia is going through a historical moment in its life as an independent country,” Colombian Ambassador Tito Saul Pinilla said at a press conference at the KITA in Seoul on Thursday. Over the next 10 years, the two sides will knock down tariffs on over 96 percent of goods and roughly 98 percent of imports by volume. According to the KITA, the two countries have complementary trade structures -- with Colombia producing raw materials and Korea making industrial goods -- that can be harmonized for bilateral commerce and export to third markets. With a population of 48 million – the third-largest in Central and Latin America after Brazil and Mexico -- Colombia is a growing country with a young, well-educated and rising middle class. Its economy has expanded at over 4 percent annually over the last decade, bolstered by 47 free trade agreements worldwide, including with Korea, the United States, the European Union and the subregional bloc Mercosur, which comprises Argentina, Brazil, Paraguay, Uruguay and Venezuela. Bogota has laid out its five-year national development plan covering 2014-2018 with a view to harness manufacturing, energy and mineral extraction and infrastructure construction worth over $352 billion. In this regard, Korea can partner Colombia in information communications technology, electronic commerce, health and medical services and equipment, and renewable energies, the agency noted. The country has vast untapped reserves of petroleum (estimated 47 to 56 billion barrels) with a liberal climate for investment, according to the Korea Institute for International Economic Policy. The institute advised establishing joint industrialization strategies and business models that combine Korea’s advanced technologies, marketing know-how and cultural content with Colombia’s natural resources, abundant labor and Latin American market acumen. Investment agency ProColombia is affiliated with the embassy and provides up-to-date information for potential investors. In an interview with The Korea Herald, Pinilla said the likely beneficiaries from the deal would be agriculture (where key goods are coffee, flour, tropical fruits and vegetables, cocoa, beef, pork and dairy products), textiles and leather goods, cosmetics, mining, minerals (particularly coal, gold, silver, emerald, copper and platinum) and oil. “Colombia is the brightest star in the Latin American constellation,” he said, adding that his country has made strides in democracy, economy, security, education and public health over the last decade. There are windfalls to be gained in infrastructure development in Colombia, according to the envoy, such as metro systems, highways, airports and ports through public private partnerships. The administration of President Juan Manuel Santos also plans to construct 1 million units of public housing, with 200,000 already built. Highlighting the regional economic body Pacific Alliance, comprised of Mexico, Peru, Chile and Colombia, the ambassador added that firms could locate in Colombia to penetrate Central and Latin American markets tariff-free. For joint ventures, promising sectors are automobile and auto parts manufacturing, machinery and electronics, home appliances, textiles, fishery, forestry, marine transport, energy and minerals, pharmaceuticals, information communications technology and tourism, according to the embassy.